is professor of Germanic languages and literature at Duke University in North Carolina. Her latest book is Sibling Action: The Genealogical Structure of Modernity (2017). 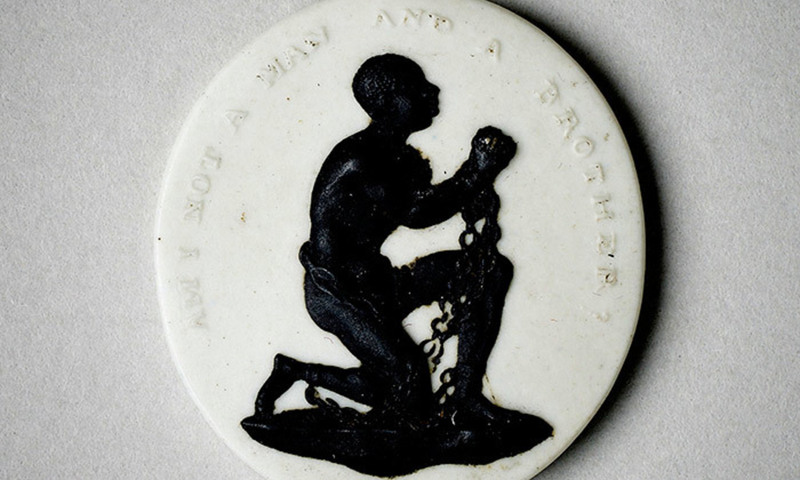 In 1787, the Society for the Abolition of the Slave Trade in London designed a ceramic medallion. It depicted a kneeling black man in chains, under the words ‘Am I Not a Man and a Brother?’ and was worn in the form of brooches, pendants and hair pins, as well as reproduced on larger decorative objects. The claim of brotherhood was no mere rhetorical flourish. Shared parentage, or shared ancestry, undergirds the concept of brotherhood. But at the time, the theory of multiple human origins – polygenesis – was gaining ground. Indeed, the idea that humans descended from separate original pairs in different parts of the globe would become the dominant scientific theory in the first half of the 19th century, and remain so until the rise of evolutionary theory late in the century. The medallion, by contrast, took a stand for shared human heritage. Both polygenists and monogenists contributed to the growing acceptance of the new European theories of race that classified humans into distinct hereditary groups. Moreover, in a broader sense, both participated in a new way of thinking about classification, namely they used genealogical concepts to organise knowledge and create categories. Where did this genealogical method come from? Race theory was far from the only new field dependent on a genealogical structure. The genealogical method – called the comparative method at the time – emerged from the new significance granted to history in the late-18th century. To take living organisms as an example, the Swedish botanist Carl Linnaeus’s classification schema in the mid-18th century used similarities in anatomy and physiology to group organisms into nested categories he designed, from the species to the kingdom. The system brought order to a chaotic profusion of organisms, but its objects were envisioned as static. While the boundaries around species were assumed to be God-given and hence present in nature, the higher levels of classification were viewed as a matter of human convenience. Even while building on Linnaean nomenclature and classifications a century later, Charles Darwin turned their assumptions on their head. He declared the boundaries around species conventional and a matter of human convenience, while the similarities by which species could be grouped together were present in nature, springing from a reproductive history of descent from a common ancestor. This thought inspired his famous 1837 drawing of a branching evolutionary tree with the enigmatic caption ‘I think’. Surprisingly enough, the fields which first developed the idea of thinking about genealogical relationships in terms of trees had nothing to do with living beings, but instead with the study of languages and of manuscripts. Thinkers began writing in the 17th century of ‘mother’ languages and the ‘daughter’ languages that developed from them, although without a good sense of how to differentiate descent from borrowings of vocabulary. Classicists and Biblical scholars added rigour to this method in the 18th century, when they painstakingly traced the histories of hand-copied manuscripts in the hopes of reconstructing accurate originals. Each time a mistake was introduced by a copyist, that mistake would be integrated into all later copies made from it – its daughters and granddaughters – providing a sign that allowed scholars to organise manuscripts into lineages. Any new copying error caused a split within a lineage on such a family tree. Linguists, historians of religion, race theorists and eventually biologists would adapt this structure of splitting through deviation to describe the development and diversification of their own objects of study. Manuscript studies had an advantage over other genealogical fields because a manuscript is a discrete entity with clear boundaries, something that cannot be said of languages, species, races and religions. And yet, it was only as the genealogical method came to organise these more complex entities that its power as an organising principle – right or wrong – was revealed. By transforming the biological and cultural world into families, the genealogical method invested knowledge with emotion and turned scholarship across the sciences, social sciences and humanities into identity politics. Once applied to living things and cultural phenomena, after all, genealogy became personal. You were said to belong to a language family, to a race, to a religion, to a nation, to a species. And others across the globe either belonged to the same family or not. The systems were therefore never neutral. And precisely that lack of neutrality made them wildly successful in promoting new ideologies of personal identity, of group belonging, of social hierarchies, and in bolstering the authority of science. While lineage formed the backbone of genealogical systems, it is the lateral relationship – brotherhood or sisterhood – that indicates which contemporary members belong to the same close family. In fact, the sibling dominated the language of alliance and affiliation in knowledge systems increasingly from the late-18th century, extending from the fraternity of a nation, to sister languages, the brotherhood of races, and eventually sibling species. Yet looked at more closely, the sibling element reveals an instability at the root of any genealogical system. If God had created languages and species, or had produced races as a mark of Cain, as people once believed, then there would be natural kinds. In historically changing systems, on the other hand, everything is in flux and the lines between things are fluid and contingent. But to build a classification, you need things to classify. The only way to define a thing in this new paradigm is to separate it from other, similar and closely related things. When you do that, you end up not with one thing, but with a set of things – a set of siblings. No genealogical system therefore can exist without siblings, and yet the closeness of siblings is a disruptive force, pointing to a certain arbitrariness in determining the identity of any given term, because the line could always have been drawn in a slightly different place. The success of the genealogical method did not match up with accuracy and, indeed, many of the genealogical sciences were extraordinarily pernicious. Europeans divided the world into genealogical races, and concluded that their own was the one best adapted for self-governance and intelligence; European linguists posited their own language family – which they named Aryan – as the most intellectually flexible, and claimed that other languages did not enable creative, philosophical or political thought to the same degree. Similarly, in the field of comparative religion, 19th-century Christian European scholars expended a lot of energy in the attempt to establish a genealogical relationship between Christianity and the mythologies of Indo-European language speakers that could replace the idea of Christianity as the child or sibling of Judaism. In other words, genealogical research did not so much create a system of European identity and kinship, but rather European ideas about desired affinities and kinships created both the genealogical fields and the genealogies they developed. The tree is no longer seen as an adequate structure even in the fields for which it was most productive, such as evolution, linguistics and anthropology. One problem with trees is that they acknowledge only diversification (branches of a tree split, but don’t rejoin), while the histories of languages and species also encompass forms of merging – from lateral gene-transfer to hereditary symbiosis, from language creolisation to borderland influences. Race theory itself sprang out of the anxiety caused by sexual mixing – which had become prevalent under the exploitation of slavery and colonialisation; and religious history had to come to terms with mass conversions such as that of Europeans to Christianity. If the evolutionary tree proved remarkably productive, and linguistics was able in the late-20th century to distance itself from the Aryan spectre it had loosed on the world, that spectre nonetheless still exists. It has merged with the race theory with which it was always allied. Race theory has proven frighteningly tenacious, continuing to structure social existence in spite of its falsity. Classification remains necessary for understanding the world. But we would benefit from acknowledging the contingency of classification systems, recognising their fluidity over time as we adapt them to new situations and purposes. Projecting our own thought processes onto nature, and then believing we found them there, is always a dangerous precursor to injustice. While the abolitionists had praiseworthy aims, applying the logic of families to human groups as a way to acknowledge ethical obligation is bound to backfire. The rhetorical power of brotherhood depends on the conviction that families have a special closeness. Genealogy can therefore knit some together only at the expense of others.